it was previously based on the River Medway in kent and has spent most of it's life on tidal water. without ever being on a truck or trailer, long may she continue the adventure. Most of this website is just photo's from the renovation and a few trip piccies so bear with slow download speeds. 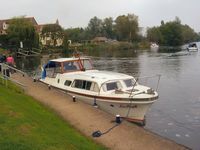 but continues to cruise the norfolk broads regularly with Chris and Louise at the helm. Long may it do so!